What is the number one goal for our lunches these days? EASY! With the boys home everyday with school we juggle their studies, my work, plus the everyday house duties that call. Maybe I should plan our meals weekly like I do with dinner, but like I said I just find the easiest solution that day. 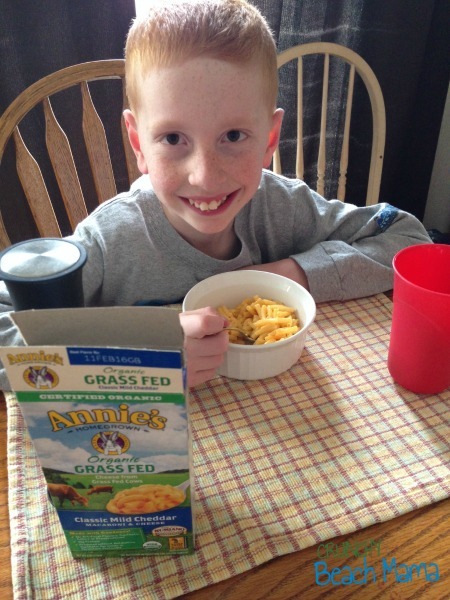 Ask this guy what he wants for lunch and he’ll say Annie’s Homegrown Organic Mac and Cheese. Every.Single.Day. No joke. Was he stoked to see a box in our latest Whole Foods delivery? Yes he was! We had never seen this flavor before. Not only is it Organic Grass Fed, but it is made with the organic cheese Rumiano! We love Rumiano which we buy from Whole Foods! Nice. 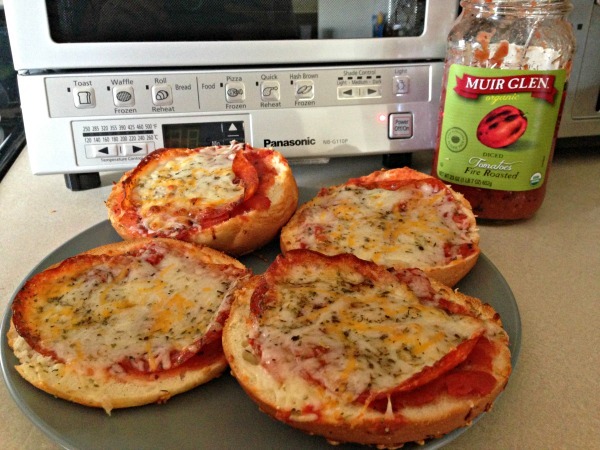 Bagel Pizzas is one of favorites and Muir Glen’s Organic Tomatoes made it even yummier. Did you know their tomatoes are harvested at the peak of ripeness and delivered to the processing facility within hours of picking and triple washed to guarantee no cleaning agents are present? Wish more companies were this dedicated! Try the Fire Roasted which are roasted over open flames. 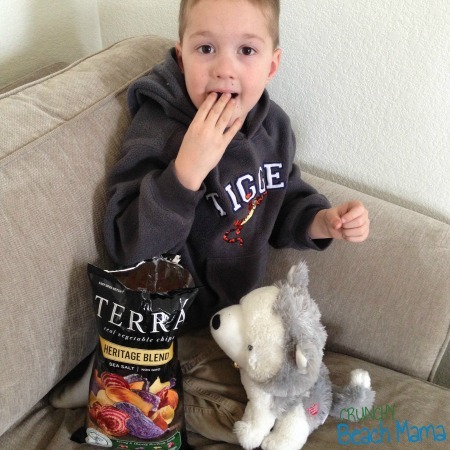 For a snack we’ve been munching on non-GMO Terra Real Vegetable Chips. Now we are a potato chip family and I do try to find the best. I don’t think I’ve ever had vegetable chips before so I was excited to try them! We had Hertiage Blend and Beauregard Sweets and each flavor are made with vegetable varities that are part of the Seed Savers Exchange, a nonprofit dedicated to saving and sharing heirloom seeds and plants. Puppy liked them too! Last but not least, we need a dessert or something sweet(er). Greyston Bakery Cookie Tin hits the spot and P’Diddy would have eaten this whole carton if I would have let him. 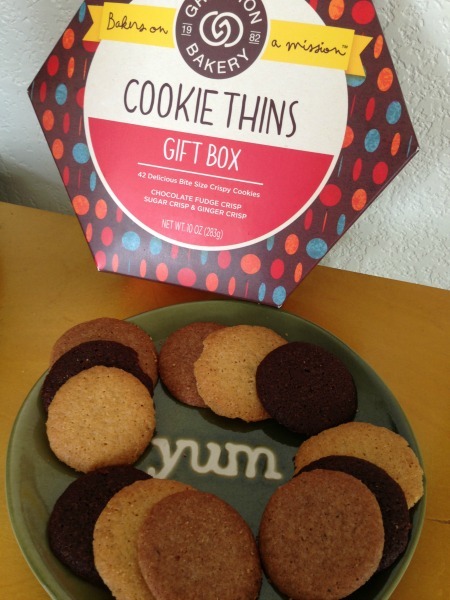 Buttery cookie thins in Traditional Sugar, Chocolate Chip, Ginger and Chocolate Fudge Brownie they definitely hit the spot. I don’t want to forget to tell you that they are made with Fair Trade sugar and cocoa and part of the sales goes to Whole Planet Foundation. Tiny But Mighty Heirloom Microwaveable Popcorn non-GMO popcorn with kernals half the size and avilable in Butter, Light Butter and Kettle Corn. It comes in popped bags too! Madecasse Holiday Chocolate Bar in Cranberry , Hazelnut, Peppermint and Winter Spice. Sourced and made Fair Trade in Africa from start to finish. yummmm chocolate! Third Street Festivus Spicy Pumpkin Chai made with Fair Trade Certified Tea and organic spices. Mix with milk for a spicy, but sweet treat! I’ve noticed almost all of these products on display at Whole Foods Market. Have you? Keep your eye out! WIN a $10 gift card to Whole Foods! I received these products for review and all opinions are my own. This giveaway will end on December 29, 2014 at midnight EST. Winners will be drawn via rafflecopter. Once a winner is drawn I will contact them and they will have 48 hours to reply before I draw a new winner. Giveaway is open to anyone in US and you must be 18 years of age or older. Giveaway not affiliated with Facebook & I release them of liability. Winner will be posted in the rafflecopter widget. I love whole foods. Bagel pizzas are a genius quick idea for lunch! Thanks for the idea. I love the bulk granola and freshly ground nut butters. I love the specialty coffee and candy. I LOVE whole foods, esp specialty organic stuff. I like to buy 365 products at Whole Foods. I love using the bulk bins to make my own trail mix. I like their fresh meats. I love getting olives at their olive bar! I love to buy Jessica's Natural Foods Gluten-Free Chocolate Chip Granola from Whole Foods! 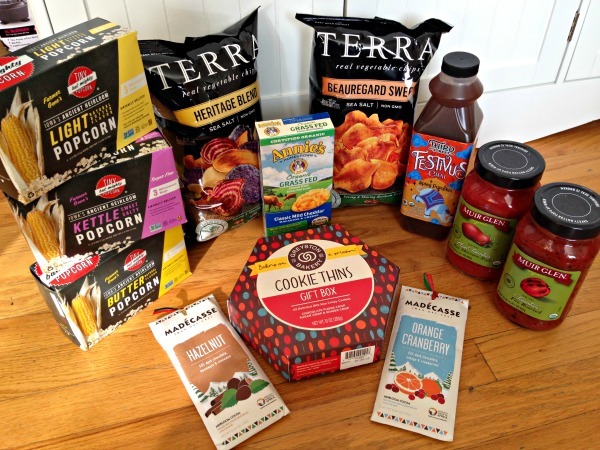 We shop for gluten free foods for my son they have such a great selection of foods. My favorite thing to buy there is the various types of ravioli and fresh squeezed juices! I love their odwalla drinks and their vegan chicken so good but so expensive! My favorite thing to buy at Whole Foods is cheese! We love the fresh produce. Our WF often has great produce prices! I love to get their fresh salads from the deli. Well we don't have any around here so this would go to my sister! I would like to try the Madecasse Holiday Chocolate Bar though! Fresh fruit bar & salad bar is great.. I like Grade B syrup because it still tastes good but has much more nutrients and vitamins and mixed with water and lemon juice, it makes for such a great, natural energy drink. I also like their selection of cheese. I like to buy Tazo Giant Peach Tea at Whole Foods. I love their salad bar! Great organic choices! I love buying produce from Whole Foods as well as perusing their amazing wine selection. I'm currently addicted to crunchy kale! So yummy! Non dairy yogurt! Can't find it anywhere close. I always buy milk there, but I love so many things esp the organic fruits - and esp when on sale!!! My favorite thing to buy at Whole Foods is Chia seeds. I don't have a Whole Foods here, but my son shops for produce and dairy products there. My favorite thing to buy at Whole Foods is lunch at their hot/salad bars! I love to go to whole Foods for gourmet cheeses. Oh man yes, I love cheese, and they have some very very gourmet ones, can't find anywhere else. I love everything about whole foods but my most favorite item to buy is Grade A Shea Butter ... it's fabulous! I like to buy produce at Whole Foods, it's the best. Love their food bars. Detox salad is my favorite. I like to buy cheese and fresh produce. Thank you! The handmade bars of soap!! I haven't had a chance to shop there yet. We haven't had one for very long. Oh my, every time I go into Whole Foods I spend at least $100! I am vegan and I live in a rural town, so when I do go to Whole Foods, I stock up on vegan cheese and vegan foods that I cannot buy at home. One of my indulgences is Field Roast sausages! Also my husband can spend an hour at the cheese counter (he is not vegan) and we usually leave with some cheese and a bowl from the olive bar. Pretty much anything? LOL...I like the snack bar/food bar and the variety of cheeses. Cheese, cheese, cheese! Whole Foods has the best cheese selection and they let you sample before you buy it. I love to buy almond butter at whole foods! I have actually not set foot in a Whole Foods because Sunflower was always closer. My son and his wife shop there all the time. My favorite thing to buy at whole foods is guacamole. I recently learned we are getting a Whole Foods in our area. I'm excited to check it out. Oh I have never been there before. We have a fairly new one not far from me, I would love to check out their gluten free selections! I like to buy their deli sandwiches. I like their Vanilla Meringue Cookies. I love their Chicken Pot Pie in the prepared foods section. It is so good. I, also, love the New Zealand white cheddar cheese that they have. I could go on and on. I love that store. I've never purchased anything at Whole Foods! I don't know! They just opened one an hour away and I have been really wanting to go look around! I love the Greens bars and the nuts/dried fruit section and prepared sections. I love their organic yogurts. One of my favorite things is the salsa they sell in the fresh case. I love their fresh organic produce and their huge selection of cheeses! I like to buy fruits and veggies there. I like to go for lunch and grab the chicken ceasar pasta salad. My fave thing to buy at Whole Foods is Lily brand chocolate products, bars and chips, they are sweetened with stevia, no sugar. I like their 365 products. Thanks for the contest. I love to buy essential oils and other bath/body products there! I like to buy meat from whole foods. They always have a great variety and it is so fresh. I love to buy cold cuts there. My favorite thing to buy there is their fresh fruit!